Christina Gil was a high-school English teacher for sixteen years, but she recently left the classroom to follow a dream and move with her family to an ecovillage in rural Missouri. She believes that teaching creative writing helps students excel on standardized tests, that deeply analyzing and unpacking a poemis a fabulous way to spend an hour or so, and that Shakespeare is always better with sound effects. When she is not hauling water to her tiny home, she can be found homeschooling her two kids or meeting with her neighbors about the best way to run their village. I have been trying to sell resources on Teachers Pay Teachers, and I admit to stalking checking out some of the top sellers. Many of them sell handouts or posters or worksheets that teach students to identify literary elements. In my opinion, this type of lesson is a complete waste of time. There is no standardized test—not the new SAT or the PARCC test or the AP Literature or AP Language—where students are required to define literary terms. And there is no place on any of these tests where students are required to spot them either. What they have to know is how those elements work to create meaning. This means that if they don’t know the difference between personification and anthropomorphism, but they understand the effect of the phrase on the reader and how that effect helps the author make her point, then they are all set. 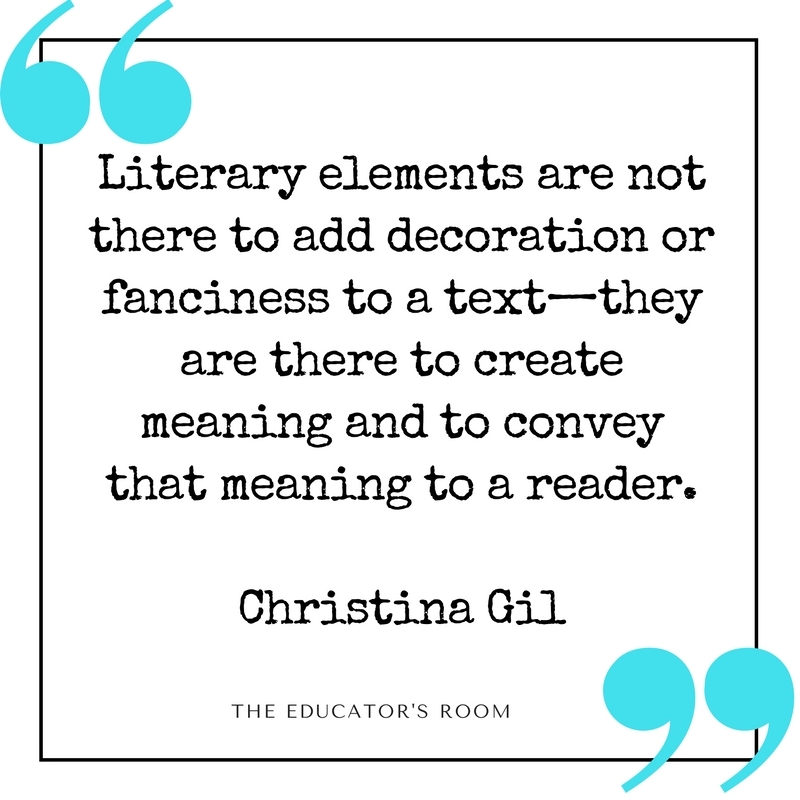 Literary elements are not there to add decoration or fanciness to a text—they are there to create meaning and to convey that meaning to a reader. I understand that it is very easy to test for literary element definitions—so easy, in fact, that it can be done with a multiple choice quiz. But even though that might be a nice break for an already over-worked English teacher, it’s not what I want my students to learn. It takes time to teach students how literature works, but when broken down into steps, it is not such a big mystery. This is the process that I use to teach my students to understand how literary elements create meaning in a text. First, I ask them to notice whatever they can. They might annotate a text or just circle or underline or take notes in any way they want. The important thing is for them to see what pops out as being important or interestingly written before they are even thinking about why these pieces are important. I encourage them to go with their gut here, and just find what they can. If they happen to realize that the phrase that they especially like is a metaphor or if they recognize that the word that pops out at them is paradoxical, that’s fine. But they don’t need to identify these elements, just find the special parts. Then I ask them to think about how those special words or phrases affect the reader. What associations do they have with the chosen words? What images are created by the vivid descriptions? What emotions are evoked by the circled or underlined sentences? How do the author’s choices make them feel? What do they think of when they read these pieces to which their attention has been drawn? Now it’s time to think about main ideas. Students are usually very practiced in this, though sometimes it takes a little pushing to get them to find the whole idea of a text. They will have a main idea when they can answer this question: What point is the author making about people or the world in general? Then they bring it all together. Those emotions that they felt and those associations that were created helped them to understand the meaning in the text. In other words, the reason why the author chose such a unique word for second line of the first stanza or such a vivid metaphor to describe the way he felt in the third line of the first stanza was to convey his idea to the reader. So maybe if the main point is that kids who are abused by their parents often make excuses for the abuser, then the paradoxical feelings of sadness and happiness created by the image of dancing in the first stanza help create that meaning. Or if the main idea is that love is sweeter and more intense when it won’t last long, then the image at the end of the poem of the warm dying fire helps the reader feel the way that the speaker does. It’s definitely not as easy to teach your students to think about how meaning is created. But it is so much more important than teaching them to memorize and identify. Ultimately, when you teach them to discuss and write about how literary elements create meaning in a text, you are teaching them to think for themselves. And what could be more important or a better use of class time than that? I totally agree and know that students spend entirely too much time with level one identification of literary terms. However, students have to learn these terms before they can rigorously apply this knowledge to a text and make meaning. I do agree that it is good to learn terms, but by the time students are in high school it is way too easy for them. They can usually identify a metaphor in their sleep, so it’s not exactly teaching them to give them a quiz on just the terms. Fascinating and practical. I think this would be a useful exercise for anyone approaching literature, at any phase, in fact. Love this insight! In addition to what you point out, I feel like the next level of mastery involves creation – students create – or recreate- these elements on their own. This allows them to not only understand their meaning but to utilize them with skill to invent meaning of their own. Great article! Makes me think differently about the activities I design. I agree. Honestly, by the time students reach high school, it should be about critical reading, deep discussion, and writing. I’m going to politely disagree with this author. As a writer, how can you use literary elements in your writing if you cant identify them? As an artist, we all learn the basic discipline specific language so that we can have technical conversations about the art and it’s meaning. Without an understanding of that terminology along with application beyond a multiple choice test, I can’t really expect any deep conversations with students about authors craft. As a student, I may make a claim that has nothing to do with literary terminology or devices, but I may use those devices as support to make my claim. That language is a gateway to access deeper conversation in literature. That access is especially important for students with lower socioeconomic economic status. I’ve had the same issues with teaching grammar. If we don’t teach terms like subject and predicate, how can we teach parallelism. In regards to standardized testing, I hope as English professionals we would be teaching skills beyond what testing asks of them. Getting a 5 on an AP test has little to do with a true understanding of great writing. I’m so glad that you’re not teaching any more. I absolutely disagree with everything that you’re saying. Before students can discuss literature, they must know and be able to identify its aggregate parts. I would argue that late elementary is absolutely the time to teach kids to identify the lit elements so they have a basic foundation and can then synthesize and analyze with them as they move into high school (mine do in 8th) with a working vocabulary and without having to figure out how to identify as well as working with those concepts at a higher level. I’ve taught two years of Special Education Language Arts (8th grade), with zero background in Language Arts. I’ve had to learn as I go, and it has not been fun! I love helping my students, but I feel torn. They did great with class discussions, but when asked to do your prescribed tasks independently they fall apart. My students struggle with writing sentences! Do you have any suggestions about what I should really be teaching these students?? I keep asking myself what do my students need most?? Then I search desperately to find materials that are age appropriate and engaging. I’m going into my 3rd year just as uncomfortable as my first. I have to teach reading fluency, comprehension, grammar, and writing in 55 minutes 5 days per week. You may be right on those assessments, but the NWEA MAP assessment DOES require elementary students to know literary devices. I found this to be true while proctoring testing and noticing some questions. I reviewed a literary device a day, just a quick intro and then some practice and scores jumped. Overall, don’t skip it, but do you really need to spend a massive amount of time on this? No. Check out the released PARCC items. Whole essays have to be written on literary devices.